YANGON, Myanmar -- A Myanmar court sentenced two Reuters journalists to seven years in prison Monday for illegal possession of official documents, a ruling met with international outrage and one that that will add to condemnation of the military's alleged human rights abuses against Rohingya Muslims. Wa Lone, 32, and Kyaw Soe Oo, 28, had been reporting on the brutal crackdown by security forces on the Rohingya in Myanmar's Rakhine state when they were arrested and charged with violating the colonial-era Official Secrets Act, punishable by up to 14 years in prison. They had pleaded not guilty, contending that they were framed by police. Some 700,000 Rohingya fled to neighboring Bangladesh to escape the violence targeting them after attacks by Rohingya militants in which a dozen members of the security forces were killed last summer. The case has drawn worldwide attention as an example of how democratic reforms in long-isolated Myanmar have stalled under the civilian government of Nobel Peace laureate Aung San Suu Kyi, which took power in 2016. Though the military, which ruled the country for a half-century, maintains control of several key ministries, Suu Kyi's rise to government had raised hopes for an accelerated transition to full democracy and her stance on the Rohingya crisis has disappointed many former admirers. In a statement sent Monday, the U.S. Embassy in Myanmar called the sentences "deeply troubling for all who support press freedom and the transition toward democracy in Myanmar." Europen Union Ambassador to Myanmar Kristian Schmidt sent a tweet -- a file photo of him meeting the imprisoned journalists -- using the hashtag #freeWaLoneKyawSoeOo. The EU said in a separate statement that the two men's cases should be reviewed, "and they should be released immediately and unconditionally." 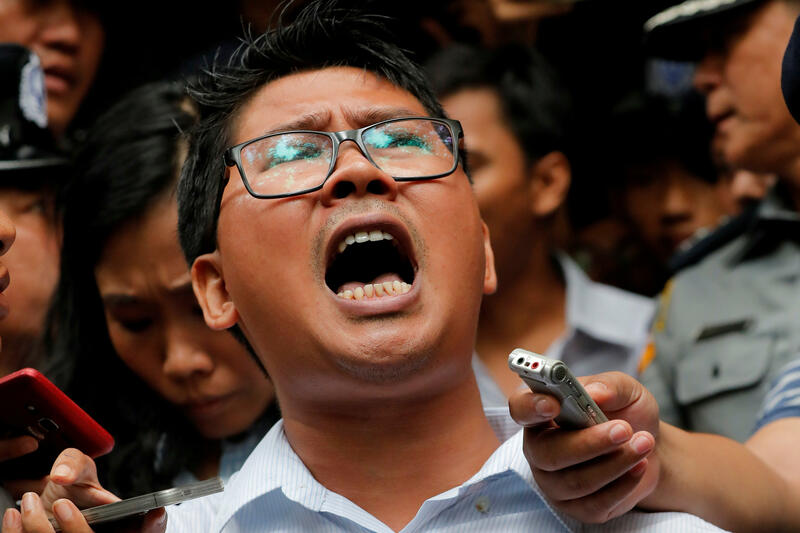 "What happened today threatens to undermine the rule of law and freedom of press that democracy requires," said Kevin Krolicki, Reuters' regional editor for Asia. He called the verdict "heartbreaking." U.N. Resident and Humanitarian Coordinator in Myanmar Knut Ostby said the U.N. was "disappointed by today's court decision." "The United Nations has- consistently called for the release of the Reuters journalists and urged the authorities to respect their right to pursue freedom of expression and information," he said. "Wa Lone and Kyaw Soe Oo should be allowed to return to their families and continue their work as journalists." U.S. ambassador Scot Marciel said the verdict was "deeply troubling for everybody who has struggled so hard here for media freedom. I think one has to ask will this process increase or decrease the confidence the people of Myanmar have in their justice system." Washington's envoy to the United Nations, Nikki Haley, had said the Trump administration expected to see the two journalists acquitted of all charges. Haley told the Security Council during a discussion of the Rohingya crisis last week that "a free and responsible press is critical for any democracy." Human Rights Watch bashed the verdict, saying the conviction of the journalists "on politically motivated charges heralds a return to the media repression seen during military rule" in Myanmar. The reporters both testified they suffered harsh treatment during their initial interrogations. Their several appeals for release on bail were rejected. Wa Lone's wife, Pan Ei Mon, gave birth to the couple's first child in Yangon on Aug. 10, but Wa Lone has not yet seen his daughter. Investigators working for the U.N.'s top human rights body said last week that genocide charges should be brought against senior Myanmar military officers over the crackdown on the Rohingya. The accusation of genocide was rejected by Myanmar's government, but is the most serious official recommendation for prosecution so far. Also last week, Facebook banned Myanmar's powerful military chief and 19 other individuals and organizations from its site to prevent the spread of hate and misinformation in connection with the Rohingya crisis.